Even in hotbed states with a wealth of growing life science companies, the job market can be tough on new graduates and other job seekers with minimal experience. While some employers are willing to loosen degree requirements for certain positions if candidates already have an industry-based background, that usually exactly the type of exposure most newborn professionals lack. BioSpace recently spoke with executives from the California Life Science Institute (CLSI), Biocom Institute and San Francisco Bay division of the Centers of Excellence about life science opportunities for new grads in California as well as insight into the skills employers are looking for and how young professionals can go about acquiring them. BioSpace: In your opinion, are there particular life science job environments that offer better opportunities for new grads in California? Our community college students have excellent hands-on lab skills and bio manufacturing skill sets that prepare them for entry-level positions in two big areas of the life science industry: bio manufacturing and pharmaceutical firms as well as research, testing and medical laboratory firms. Those two sub sectors represent over 50 percent of the bioscience firms in California. The skills their community college education prepares them with include safety skills, good lab practices, good manufacturing practices, GOP and GMP, quality control and research. They also learn a lot of the soft skills that are needed to work in those environments such as teamwork, communication, good writing, problem solving and critical thinking. So I think that those are two major areas or environments where our students do very well. Regulatory affairs specialists and managers are among the top 14 most common life science job listings in California. 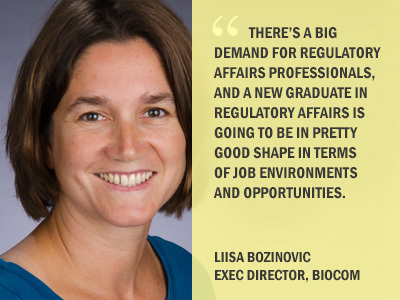 There’s a big demand for regulatory affairs professionals, and a new graduate in regulatory affairs is going to be in pretty good shape in terms of job environments and opportunities. BioSpace: What specific skills are California life science employers looking for in new grads and other job seekers? 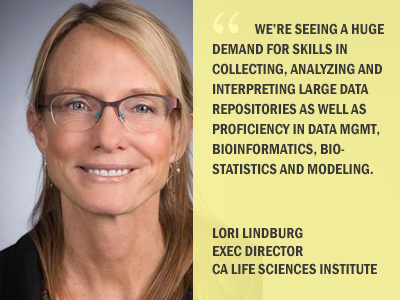 We’re seeing a huge demand for skills in collecting, analyzing and interpreting large data repositories as well as proficiency in data management, bioinformatics, biostatistics and modeling. On the genomics front specifically, employers are looking for people who understand the interplay of genes and genomic systems. And then there’s the whole range of privacy and data protection and security issues around patient data, so there’s a huge demand around big data and precision medicine. The shift to value-based healthcare is also having an influence on the types of skills employers are looking for in candidates. Healthcare providers are demanding more in terms of outcomes from life science companies, so those companies are looking for professionals who have reimbursement and regulatory expertise as well as people who just really understand the healthcare system and can work effectively with hospitals, physicians and healthcare administrators to develop risk-sharing programs or structure and manage business partnerships. Bozinovic: Some of the companies the Biocom Institute works with in the big data space are looking at students in math and computer science programs as well as bioinformatics, biostatistics and statistics. In some cases, they even consider students who are just data analysts but interested in the life science field. So there is a wide array of degrees a job seeker can get and still transition into the big data side of the life science industry. Lindburg: And let’s not forget those soft skills. Every conversation we’ve had with employers this year and also in 2014 emphasized the importance of soft skills in addition to technical expertise. I think that has a lot to do with the cyclical nature of the life science industry. There’s a lot of churn; employees don’t stay with one company for a long period of time so they need to be comfortable with uncertainty and ambiguity. They have to be able to take their transferable skills with them. And due to the growing emphasis on external partnerships, they need both verbal and written communication skills as well as the ability to work in cross-functional teams. Employers will often tell us that they can teach the technical piece but they can’t teach the soft skills. So we’re working with our academic partners to build soft skill development into their education programs. They should be mimicking what happens in the workplace so students can work in cross-functional teams and develop those essential people skills. If you’re a new grad and you already have those skills, they’ll serve you well—even if you still need to develop your technical skill range. BioSpace: What do you think is the most important thing a new grad or entry-level job seeker should do when trying to find his/her first life science job? Lindburg: It’s important to seek out work-based learning opportunities while you are in school. But you can also find these opportunities after you graduate if you’re willing to do it on a voluntary basis. We have thousands of life science startups in both the Bay Area and the San Diego region in California. Those startups are great places for current students and new grads to pick up some real-world laboratory skills because a lot of them are willing to use volunteers. As the startup grows, you might even find yourself with a position. I also recommend that students and new grads go on lots of informational interviews. They’re a really valuable way to begin to research positions, and there are lots of people in the industry who are happy to talk about their careers. I always tell the students to ask the employer who else they recommend speaking to. This helps them build their network. Keep building it and you may find someone who is actually looking to hire. Another way to build your network is to attend industry events. The California Life Sciences Institute and Biocom Institute put on 70 or 80 events with trade associations every year. Many of them are at a nominal cost and are a great opportunity for students and new grads to mingle with industry professionals. 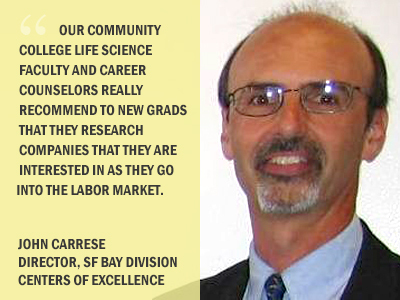 Carrese: Our community college life science faculty and career counselors really recommend to new graduates that they research companies that they are interested in as they go into the labor market. They need to really understand the mission of the company and the challenges the company is facing. As a new graduate and a candidate applying for a job, this will enable you to articulate to the employer how you can help the company address those challenges. If a new graduate can make a connection between their skill set and experience and how they can use those on the job to help the company be successful, they’ll stand out to the employer.